As Australia’s number one truck company*, we offer a comprehensive range of All-Wheel Drive (AWD) and 4x4 models purpose built to flatten the steepest hills and make light work of loose gravel. Reliability and comfort are the foundation of the AWD/4x4 range with a robust offering of features and components, both inside and out. Based on the class-leading N and F Series, there are 16 different specifications to select from, including Crew Cabs and some models with PTO as standard equipment, all tried and tested under the toughest conditions. AWD/4x4 vehicles are designed to handle the toughest of terrain, so we’ve got all bases covered. 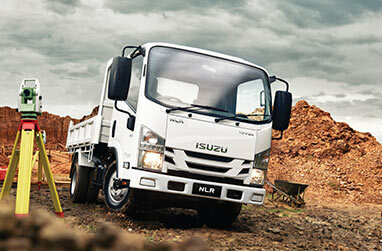 Isuzu’s range of All-Wheel Drive (AWD) and 4x4 models starts with the nimble NLS 45-150 AWD 4,500kg GVM model and goes through to the 13,900kg GVM FTS 800 4x4 model. Based on the class-leading N and F Series, there are a total of 16 specifications to select from including Crew Cab variants and selected models with PTO as standard fitment. Isuzu’s safety and reliability are legendary, and when you are driving a truck over rugged terrain there is nothing more important. For starters, Driver’s SRS airbags come standard across our entire 4x4 range. And depending on your application and model selected, you can opt for Banjo type front axles with Birfield joints, as well as 2-stage steel spring suspension with double-acting shock absorbers. 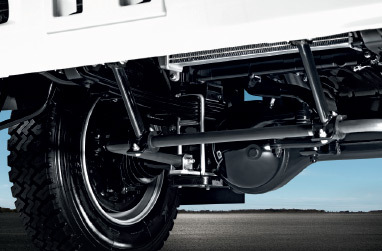 These are robust axle and suspension systems with proven durability in the most rugged of environments. 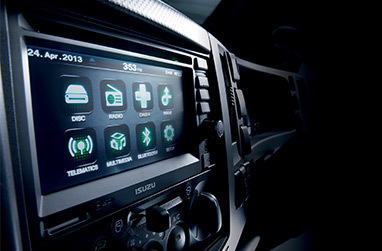 Our Digital Audio Visual Equipment (DAVE), the ultimate cab infotainment system, is right at your fingertips. Navigate through the simple menu to play your favourite songs or (digital) station. For even greater convenience and safety, use voice commands. Hands-free Bluetooth is standard, and sat-nav and tyre-pressure monitoring are extra-cost options. You’ll never work alone.